Ever had these? My mom used to make these often when I was a kid but it was never often enough. If you are unfamiliar, these are a side dish usually served with roast beef and covered in gravy. They are savory not sweet. I remember when I was a teenager that I brought my boyfriend to a family dinner. When he saw the yorkshire pudding he asked for someone to pass the jam. Jam? No, no, no, that’s all wrong. When we first went gluten free 3 years ago there were some things that I assumed we would never have again. I was sure these were one of those things. However, since figuring out my own version of a gf all purpose flour (and everyone has one) things seem so much more optimistic. These were my first try at them and just like when I was a kid a dozen was simply not enough. Hmmmm, I wonder why I am not loosing weight??? These are light and airy and scream to be covered in a rich beef gravy. No, they are not even remotely healthy with all the simple carbs but for as often as I would make a roast beef I will just enjoy them and not think about my waist line or anything else but how perfect they are. olive oil or beef fat drippings from a roast beef. Start by adding enough oil to just cover the bottom of 12 muffin tins. Using a brush coat the sides of each tin with the oil. Turn on your oven now to 425 degrees and put the well oiled muffin tin in the heating oven. The muffin tin should be nearly smoking when you add the batter. While the tin and the oven are heating, make your batter. Seriously, how easy is this? Add all ingredients together and whisk until smooth. (I actually used my immersion blender to speed up the process.) Pull the tin out of the oven and quickly pour batter evenly into tins. Return to oven and DO NOT OPEN THE DOOR. They will fall. Bake for 25 minutes. Remove from oven and serve immediately. 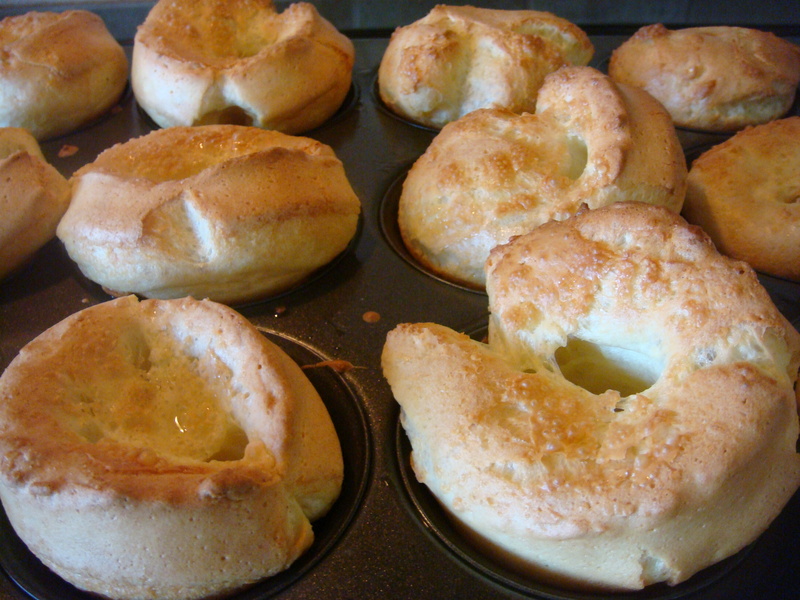 If your yorkshire puddings turn out like “hockey pucks” as my mom used to call them, don’t worry, they still taste incredible. OMG this is perfect! I used the batter to make oven apple pancakes and it was exactly right. We stopped making this when my son went gfcfsf and we hadn’t really found good substitutes. We believe he can’t have potatoes so we switched out the potato starch to corn starch. He ate 1/3 of the dish I am so glad to have found this recipe. So glad to hear this worked out for you. Apple pancakes, hey? Care to share? Sounds good. Sure! They are something that are quite swedish as I have been told. I did the batter as is except I had to switch out the potato starch for corn starch and after the first few times we found that he couldn’t tolerate the rice milk so I switched the milk to light coconut milk once and almond milk the other time. 2 to 3 apples sliced mix in a bit of sugar and cinnamon. I have the oven at 225c (think this is the same as your recipe) and put a cast iron baking pan in the oven while it is warming up with a generous amount of oil. When it is hot I usually toss in the apples and stir them around a little then pour in the batter. Bake it for 25 minutes. My son loves breakfasts so we use to eat this all the time before he had to go gfcfsf and I just hadn’t found the right recipe until now. I am really glad to have found your blog! maybe… Thanks so much for getting back to me on it.